PushNPutt flagsticks are the world’s coolest practice putting innovation in over 50 years. Patented and interactive, they easily raise your golf balls out of the hole and onto the putting surface while also protecting the cup and surrounding green. For the first time ever – no more bending over or having to take the flag stick out of the hole.” The award-winning PushNPutt offers golfers of all ages and abilities a new, FUN “better way” to practice putting. Our Made in the USA craftsmanship carries a one year replacement warranty on all of our PushNPutt flagsticks. You can be confident all of our flagsticks hold up to the highest quality standards. Will not chip, crack or peel. Greatly outlasts typical practice green flagsticks. Current practice putting green flagsticks utilize a cumbersome means of capturing practice balls in a “basket” that dates back to 1958. This outdated method causes unnecessary effort on the part of players as well as teaching pros and greater maintenance expense for course Superintendents. Players practicing on regular course and backyard putting greens must bend over to retrieve balls that fall back into the cup. Some also utilize their putter head inappropriately to “dig” the ball out, thus gouging and damaging the edge of the cup. Over time, this and the additional “footprint” from standing in place combine to further erode the surrounding green surface. This can cause additional maintenance expense on private and public courses especially due to the need for more frequent cup rotation. 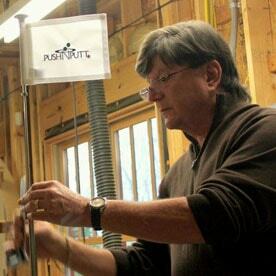 PushNPutt manufacturers and sells three models, the "Original" PnP along with the new LiftNPutt and Putter-UP! that work easily to retrieve practice putting balls without damage to the practice green. They are also “back savers” by eliminating the need to bend over. Versions are designed for PGA regulation private and public course practice greens as well as backyard putting greens. PnP is a unique fully patented and trademarked product whose time has come. It saves the superintendent money and allows the player/pro to enjoy a more efficient, productive and fun way to practice putting. When playing golf in Charleston, SC with my father-in-law, I noticed he was having difficulty getting the balls out of the hole on the practice green. I went over to help him. Out of curiosity I looked at the bottom of the flagstick basket – it was stamped "1958"! I thought to myself, ‘the world has changed many times over since then', there must be a better way.' I went back to North Carolina and began work on what would become PushNPutt.